Besides grabbing Hogan from Verne Gagne and taking a chance on Wrestlemania, putting Saturday Night’s Main Event on NBC was the best idea Vince had in the 1980s. When you consider that the majority of America back then did not have cable or satellite television, not everyone could enjoy WWF programming so this show played a big part in making the WWF the most popular wrestling promotion in the country. 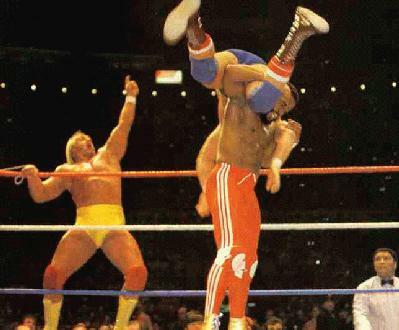 The show also played a major role in kick-starting many of the huge Wrestlemania main-event feuds. The first episode is the fallout to the first Wrestlemania. A couple things that you need to remember before I go ahead with the recap; in the main-event at Wrestlemania, Orndorff took the fall and was therefore blamed by Piper and Orton for losing the biggest match in their careers. Iron Sheik and Nikolai Volkoff captured the tag titles from the US Express, Barry Windham and Mike Rotunda. Also with Cyndi Lauper at her side, Wendi Richter regained the Women’s title against Lelani Kai who was managed by Fabulous Moolah. As you might be able to tell, I’m being a lot tamer on this show compared to the newer, over-exposed SNME’s. It’s just not the same! We hear from Wendi Richter, Cyndi Lauper, Hulk Hogan and Mr. T!